DES PLAINES, IL--(Marketwired - Sep 30, 2015) - A first-of-its-kind study from Emergency Nurses Association (ENA), published online in the Journal of Emergency Nursing, finds that moral distress in the emergency department is an experience distinct to those working in that specific environment, compared to nurses in other specializations. Moral distress occurs when someone is constrained from taking the action he or she believes is right. Authors of the study found that unlike moral distress found in other nurse settings, the causes of moral distress in emergency nurses are environment-driven, not incident driven. 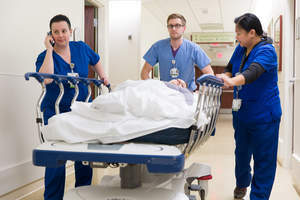 Emergency departments do not have a typical patient or day, which means emergency nurses may not have time to build relationships with patients. A nurse's interaction with a patient in the ED is measured in minutes or hours, not days like other nurse settings, and scarce resources can further impede the nurse's ability to be present and fulfill the disciplinary obligation to provide excellent care. "Emergency nursing is life-saving nursing and requires an environment where nurses can act in the best interest of their patients with more consideration of time constraint challenges," said ENA President Matthew F. Powers, MS, BSN, RN, MICP, CEN. "This study is an excellent beginning to understand the distinct causes of moral distress in emergency nurses and how to address it." Excessive documentation and a focus on time-based metrics, inadequate or unsafe staffing, and patients who are frequent users of the ED such as those with addictions or behavioral disorders, were among the specific environmental factors described by the participants as causing moral distress. These environmental limitations of emergency departments are a factor in the perception of moral distress for nurses who feel they are not able to provide adequate care to their patients. "Focus group participants expressed a common desire to provide high-quality, compassionate care to their patients but also described dysfunctional and challenging aspects of the care environment that contribute to feelings of moral distress by impeding their ability to provide safe, effective patient care," Lisa A. Wolf, PhD, RN, CEN, FAEN, and coauthors wrote. "The implications for emergency nurses as individuals, as well as for the profession, are significant and demand attention from ED and hospital administrators, but also from staff." Until now, moral distress research in nursing was limited to identifying needs specific to nurses outside emergency settings. ENA experts advise that future research should focus on the development and validation of an instrument to measure moral distress in the ED setting, as well as strategies to help emergency nurses cope with this moral distress. Emergency nurses work within strict, fast-paced guidelines that are different in the emergency department compared to other nursing settings. Emergency Nurses Association works to help prepare emergency nurses for the future of the industry.